I grew up with dogs – real-life ones and those in books. The real-life ones were my friends and even my sanctuary when the rest of the world got tough, and just the mere sniff of a dog in a book made me like it more. I haven’t touched an Enid Blyton book for years but the thought of Timmy still makes my heart skip with excitement and I’m yet to get over my yearning for a St Bernard after Rufus and Bruno in The Chalet School series. I even came to look on bull terriers with a softer eye after Heloise in I Capture the Castle. My children are exactly the same ages as my younger sister and I were when our family acquired our first dog: an Irish Setter called Penny. Penny was the first of several dogs: Irish Setters, Dalmatians and a Toller. I soon got over the urge to lie prone on the bed and joined everyone else – bar the cats, that is – in the garden. Penny, I was determined, would be my very own Roger, Timmy, Dog Monday, Jack and Pongo all rolled into one. Of course, as a child, and a young one at that, I got all the best bits of having a dog in the family and, walks in inclement weather aside (we lived in the north-west where it rains more often than it doesn’t), none of the drudgery of mopping, wiping, getting up in the night and training – although, to do them credit, my parents got me involved in all of that just as soon as I was old enough. I grew up determined that my children should have the same thing. Now they have and I am filled with a strange mixture of pleasure, excitement and trepidation. Real life dogs are much more work than literary ones but, I think, just as inspiring in their own way. Brilliant – I can see it now: your local starlight barking alive with the news that the soppy people in the house with the unfenced garden have been seen unpacking bags of shopping from their car…… And, actually, from your point of view, visiting dogs must provide a lot of the pleasure with much less of the responsibility. I can see the attraction, although I am far too in love with my boy to want things any other way right now. My son – also yet to do any poo-picking – seems to feel the same way while my husband can only be described as besotted. Still, it could be worse; it could be a car he’d fallen for…. What a cute little puppy! Dogs are a lot of work, but they’re worth it! 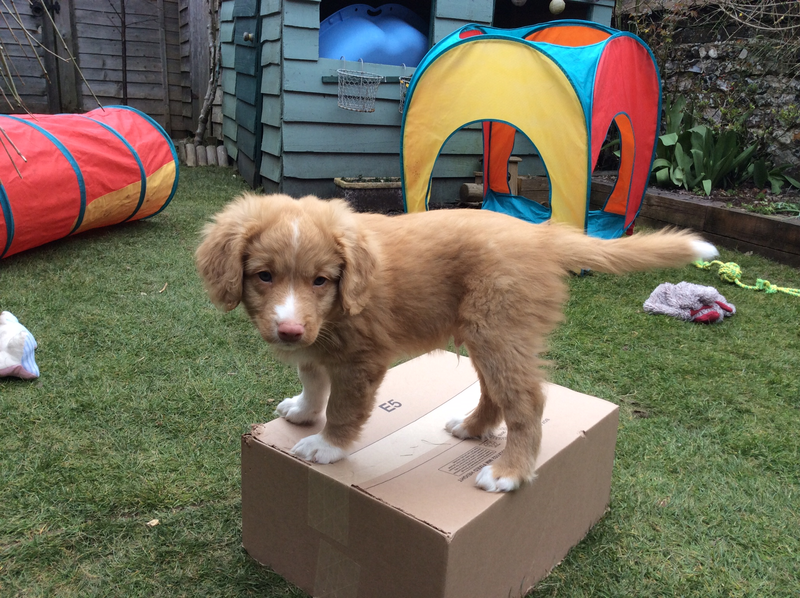 Definitely – although a puppy in the house is a salutary reminder of just how much work. I think my husband’s plea for a second dog in the not too distant future may go unanswered!